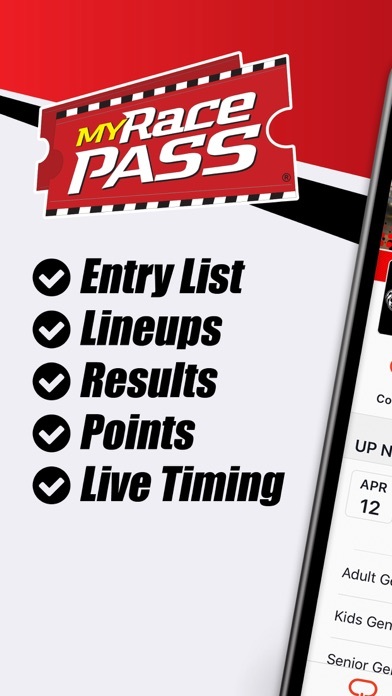 MyRacePass (MRP) gives you real-time access to lineups, results and information from thousands of race tracks. Follow your favorite tracks and series for quick access and stay up to date with all the racing action! FOR FANS - Easily access race information, lineups, results, and live timing. - Follow point standings from your favorite tracks and series. - View upcoming events to plan your next outing. - Get the latest event updates rain outs. 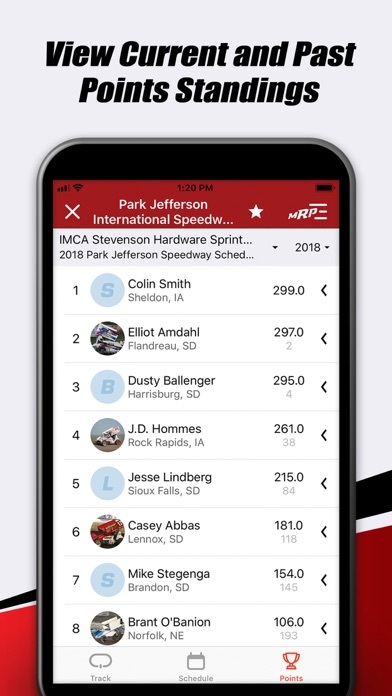 - Access race by race point breakdowns for thousands of drivers. FOR PROMOTERS - Sell more tickets for your events online. - Publish schedules and point standings for maximum distribution. - Promote your organization with on-demand apparel sales. FOR DRIVERS - Find your official results and lineups. - Review race by race point breakdowns. 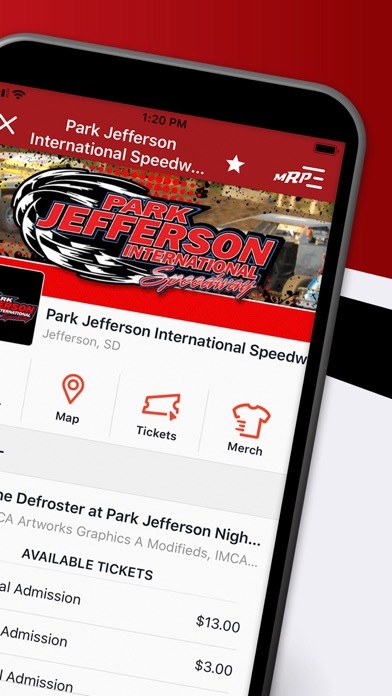 - Check into racing events by scanning your device. 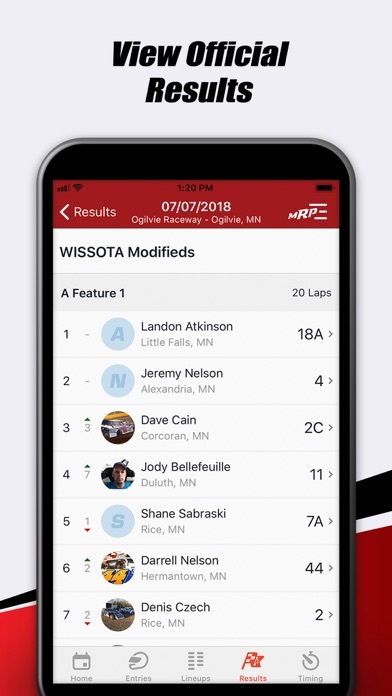 WHAT'S NEXT - Driver profiles MRP LIVE - With a MRP Live subscription you gain access to live timing and pervious lap times for all tracks using MRP Live for only $7.99/year. 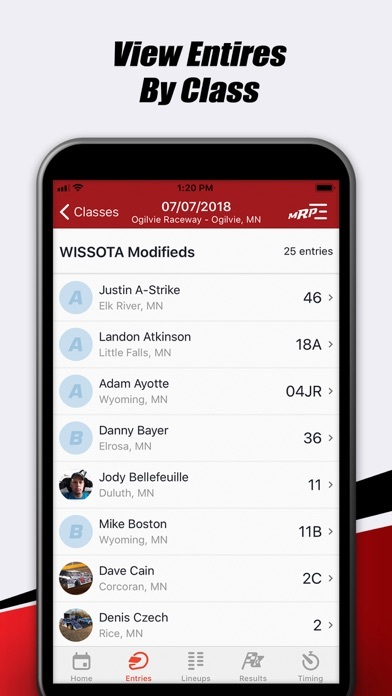 MRP INSIDER - A MRP Insider subscription comes with all the features of MRP Live AND full race-by-race points breakdown for all drivers in points throughout the MyRacePass network for only $34.99/year. MANAGE SUBSCRIPTIONS - Payment will be charged to iTunes Account at confirmation of purchase - Subscription automatically renews unless auto-renew is turned off at least 24-hours before the end of the current period - Account will be charged for renewal within 24-hours prior to the end of the current period, and identify the cost of the renewal - Subscriptions may be managed by the user and auto-renewal may be turned off by going to the user's Account Settings after purchase - Visit https://www.myracepass.com/terms for full Terms and Conditions. Like the fact that you can see lineups/car count/live feed of race progress. No complaints at all from me. I’m just sorry it took me so long to find this APP. Instead of scouring Facebook and twitter for results I can just get them in real time here. 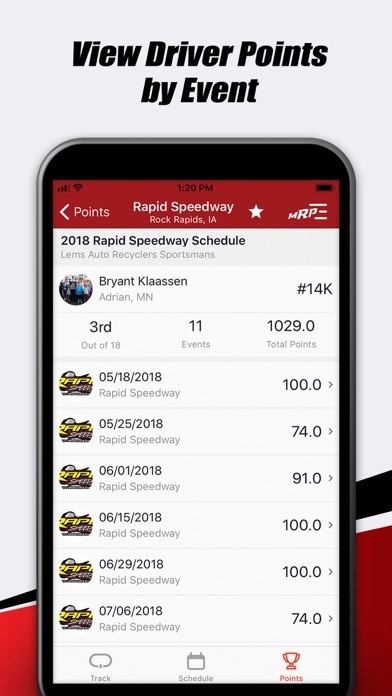 Got this app to keep up with race results, lineups and live timing while at the Chili Bowl. 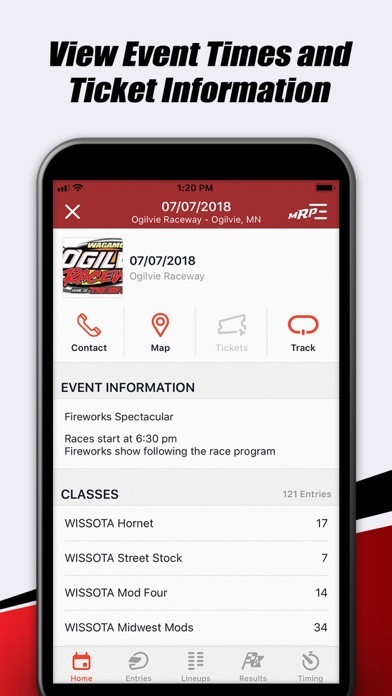 With over 350 cars entered in this one event, I thought it would be helpful to have all the information at the touch of a screen. The information is updated quickly, lap times are updated instantaneously, and everything has worked flawlessly. 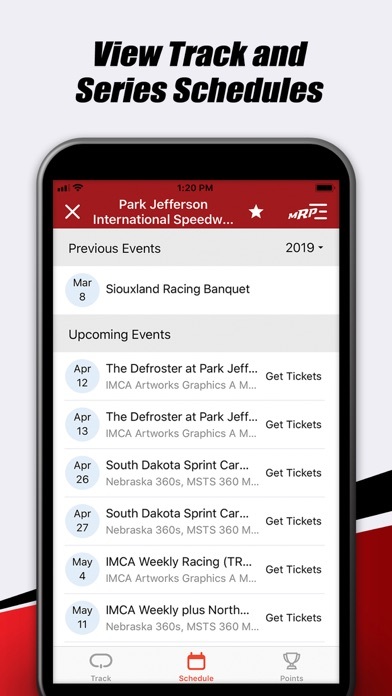 Now that I have the app, I can see how it will be an awesome tool to use to be able to keep up with events that I am unable to attend as well as using it while at the track. The idea of being able to find tracks, keep up with tracks, or just research a new track to visit with the ease of an app is an awesome idea! However, every local track for me has 0 information on it! I really think app users should be able to edit information! Some of us basically live at our local tracks during race season, we know the ins and outs of our tracks! To keep our favorite sport alive and growing, we need better information, not just a map of where it’s located! Let people leave reviews of tracks, post pictures, edit the track amenities, etc! Love the app. Great idea.! Would be great if users could input information about tracks similar to GasBuddy app. Users could provide information about coolers, restrooms, parking, etc.... I noticed a lot of tracks around me are missing basic info. So glad I found this app. It's one of those "why didn't I think of that" apps. I can't always make it to the tracks I love and it's great that I can still se how my favorite drivers are doing. App is great already, can't wait to see how it develops! 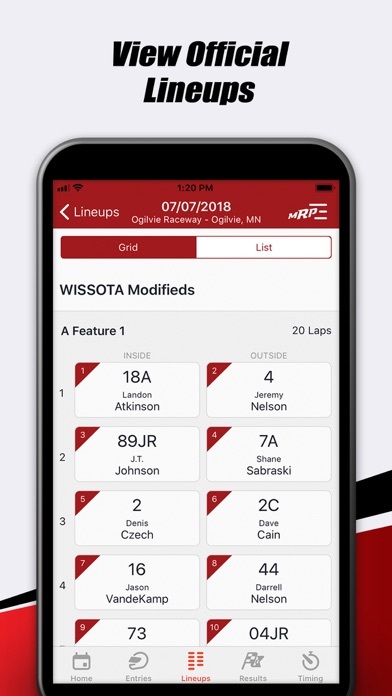 This is the best app in racing! Exactly what many fans, promoters, and drivers are wanting! I love the idea of this app, but very much prefer the format of the website instead. Don't like having to back out to look at other races at the same track on the same night. On the website, you just have to scroll down.